The Leader Of The Celestial "Magnificent Seven"
A decade-long mystery has been solved using data from ESA's X-ray observatory XMM-Newton. The brightest member of the so-called 'magnificent seven' has been found to pulsate with a period of seven seconds. The discovery casts some doubt on the recent interpretation that this object is a highly exotic celestial object known as a quark star. This X-ray image, obtained by the EPIC instrument on-board the ESA XMM-Newton observatory in October 2006 over a 19-hour observation session, shows the neutron star RXJ1856. 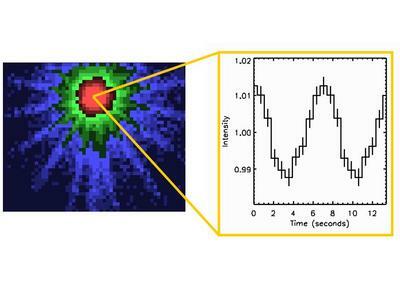 Using XMM-Newton’s data, scientists were able to find signs of the long-sought-after pulsations in RXJ1856, measuring a repeating 7-second pulsation (this corresponds to the rate at which the object rotates). The pulsation observed by XMM-Newton is shown in the inset. The magnificent seven is a collection of young neutron stars. Neutron stars are the dead hearts of once massive stars. They contain about 1.4 times the mass of the Sun but are compressed by gravity into ultra-dense spheres just 10–15 kilometres in diameter. A one Euro coin made of neutron star material would weigh more than the entire population of Earth. What sets the magnificent seven apart from the 1700 other neutron stars seen as radio pulsars is that they are not detected at radio frequencies but their surfaces are hot enough to emit X-rays. The brightest member of the magnificent seven, RXJ1856 had been a mystery to astronomers since its discovery a decade ago because, despite the fact that it is so bright, no one had been able to find any pulsations and thus determine its rotation rate. That has all changed thanks to the work of Andrea Tiengo and Sandro Mereghetti, Istituto Nazionale di Astrofisica, Milan, Italy. 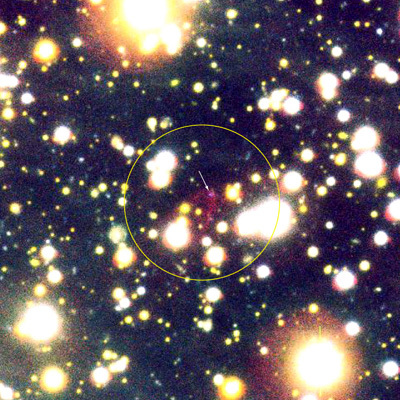 This image, obtained by the ESO/VLT ground observatory, shows the region of the sky in which the neutron star RXJ1856 (indicated by the arrow in the yellow circle) is located. Using data collected by XMM-Newton, the pair searched for any signs of the long-sought-after pulsations in RXJ1856. They were successful, finding a repeating 7-second pulsation over a 19-hour observation of the source performed in October 2006. They checked other archival data and confirmed the pulsation registered in five other XMM-Newton observations performed between 2002 and 2006. 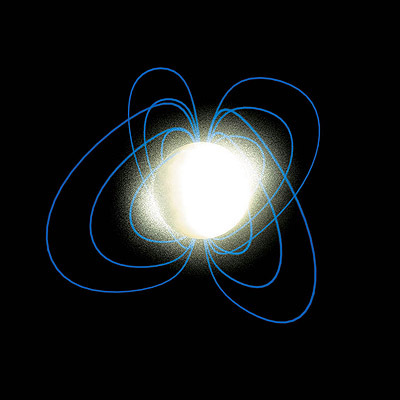 "The pulsations are a typical characteristic of a neutron star," says Tiengo. It means that the tiny object is spinning and that a hot spot on its surface is rotating into our line of vision every seven seconds, in the same way that a lighthouse sweeps its beam of light around in a circle. The pulsations in RXJ1856 have very low amplitude; this explains why they were not seen before. RXJ1856 is an intriguing object for astronomers. The Hubble Space Telescope has supplied a very accurate distance to the object: 500 light years. This has allowed astronomers to use the brightness of RXJ1856 to estimate its radius. What they found puzzled them. The estimated radius came out to be smaller than 10 kilometres. This was taken as possible evidence that RXJ1856 was an even more exotic object, known as a quark star. In such an object, gravity has crushed the atomic nuclei into their constituent quarks. "We don't rule out the quark star interpretation but the pulsations show that the object is also consistent with neutron star models," says Tiengo. Neutron stars slow down because their strong magnetic fields (one million, million times larger than the Earth’s field) and fast rotation, produce electromagnetic radiation that drains their rotational energy. Measuring the deceleration of the object would give astronomers a clue about its magnetic field, which is responsible for creating the hot spot that produces the pulsation. So astronomers are going to have to work harder to determine in which of these exotic categories RXJ1856 belongs. "If we can obtain more precise measurements of the period we can then see how fast the object is slowing down," says Mereghetti. Neutron stars slow down because their strong magnetic fields (one million, million times larger than the Earth's field) and fast rotation, produce electromagnetic radiation that drains their rotational energy. Measuring the deceleration of the object would give astronomers a clue about its magnetic field, which is responsible for creating the hot spot that produces the pulsation. Written from a news release by European Space Agency.